After rising to their highest level in almost a decade, existing-home sales slackened in February, with an inventory shortage continuing to constrain the market. Existing-home sales — completed transactions that include single-family homes, townhomes, condominiums and co-ops — slid 3.7 percent month over month to a seasonally adjusted annual rate of 5.45 million in February, but remained up by 5.4 percent from a year ago. Realtors have reported stronger foot traffic this year, but a low supply of affordable homes “continues to be the pest that’s pushing up price growth and pressuring the budgets of prospective buyers,” said NAR Chief Economist Lawrence Yun in a statement. While a growing share of homeowners say now is a good time to sell, prices will continue to “move hastily” if listings don’t increase, he added. The median existing-home price in February climbed 7.7 percent from a year ago, clocking in at $228,400 and marking the 60th straight month of year-over-year gains. Housing inventory remains anemic. February’s supply would have sold out in 3.8 months at February’s sales pace. That’s the second lowest level recorded by NAR (behind January of this year) since the trade group began tracking existing-home inventory in 1999. A six-month’s supply is generally considered necessary to support a balanced market. 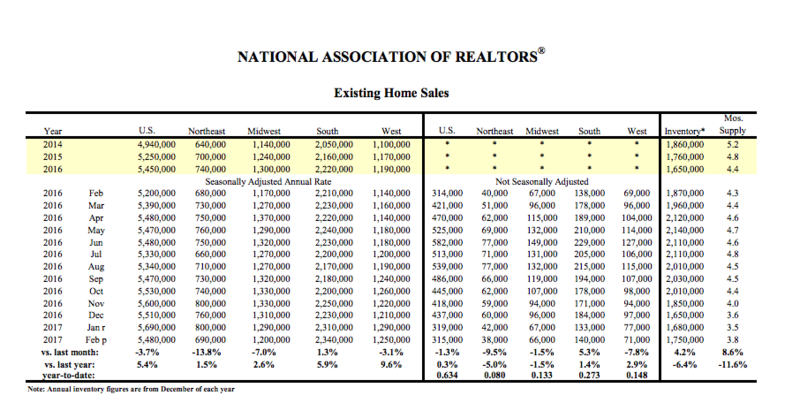 While the number of existing homes for sale climbed 4.2 percent month over month to 1.75 million, it was still 6.4 percent lower than a year ago. This hasn’t helped first-time buyers. They accounted for 32 percent of sales in February, down from 33 percent in January but up from 30 percent a year earlier. Conditions remain ripe for investors. They continued to account for an above-average level of sales, despite higher prices and a low level of distressed inventory, according to Yun. “The affordability constraints holding back renters from buying is a signal to many investors that rental demand will remain solid for the foreseeable future,” he said. “Investors are still making up an above average share of the market right now despite steadily rising home prices and few distressed properties on the market, and their financial wherewithal to pay in cash gives them a leg-up on the competition against first-time buyers,” he added. All-cash sales made up 27 percent of transactions in February, up from 23 percent the previous month and 25 percent a year ago. Individual investors purchased 17 percent of homes last month, up from 15 percent in January but down from 18 percent a year ago. Should buyer's agents attend property inspections? How much money do Opendoor sellers leave on the table?